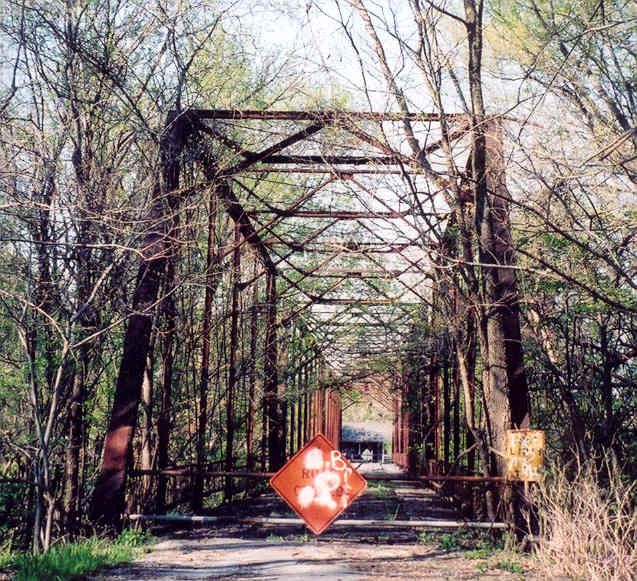 Bird Creek Bridge, Osage County. 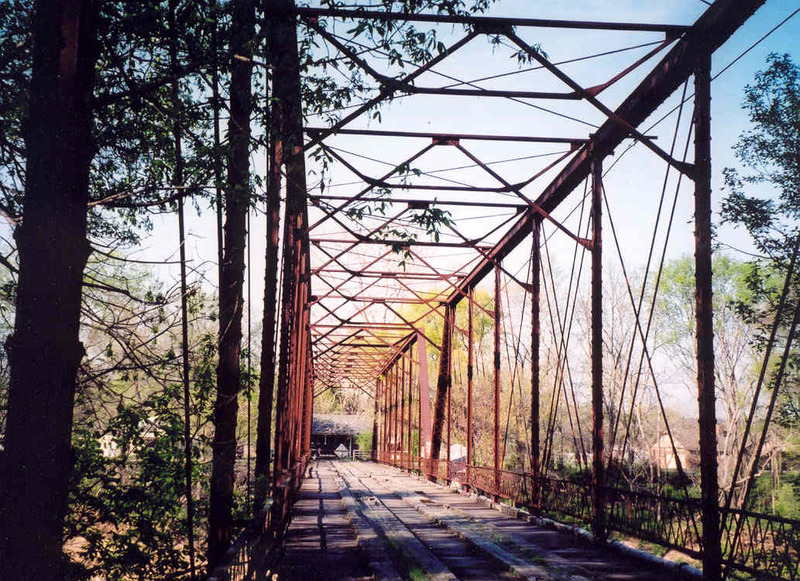 Although it now sits closed to vehicular traffic, this 1913 structure is still used by local residents to cross Bird Creek on foot. This view is the north end of the bridge. The bridge consists of three pin-connected Pratt spans. Two spans are 150-feet long each, and one span is 100-feet long. 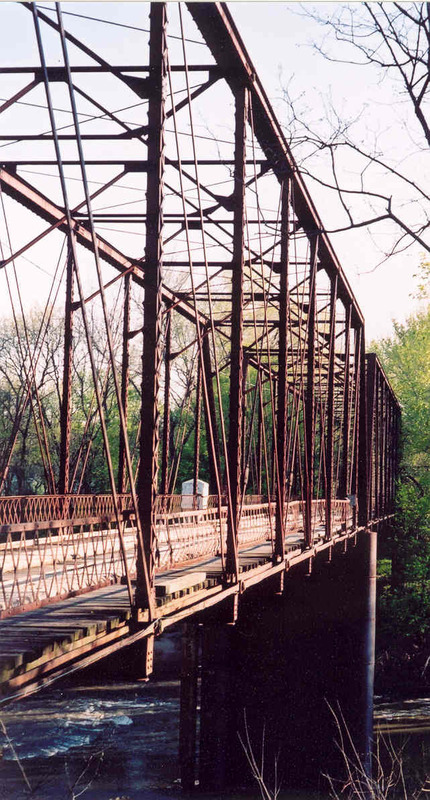 County records show that the bridge was built by The Rochester Bridge Co, of Rochester, Indiana. The total length the the bridge is 403 feet, pin to pin. Above, a view along the side of the bridge. Below, the 1913 structure as viewed from the modern concrete Avant bridge. The bridge stand nearly 30 feet above the mean water level. Above, looking north, we see the 100-foot south span. This end of the bridge is surrounded by large, shady trees. 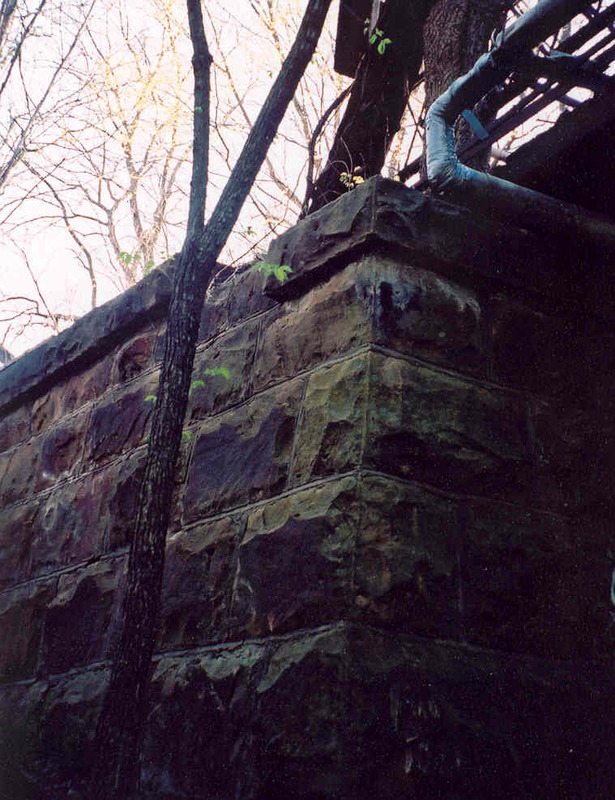 Below, one of the many attractive features of this bridge is its cut stone abutments at either end. Some of the stones are quite big, and they are all neatly dressed with a rough face. The mortar joints between them are also very neatly executed and very uniform. All stonework was found in excellent condition, and no mortar or pointing was missing. Below, a view of the bridge's underside. All piers are of the cylindrical steel type, riveted together from plates like a boiler, and filled with concrete. 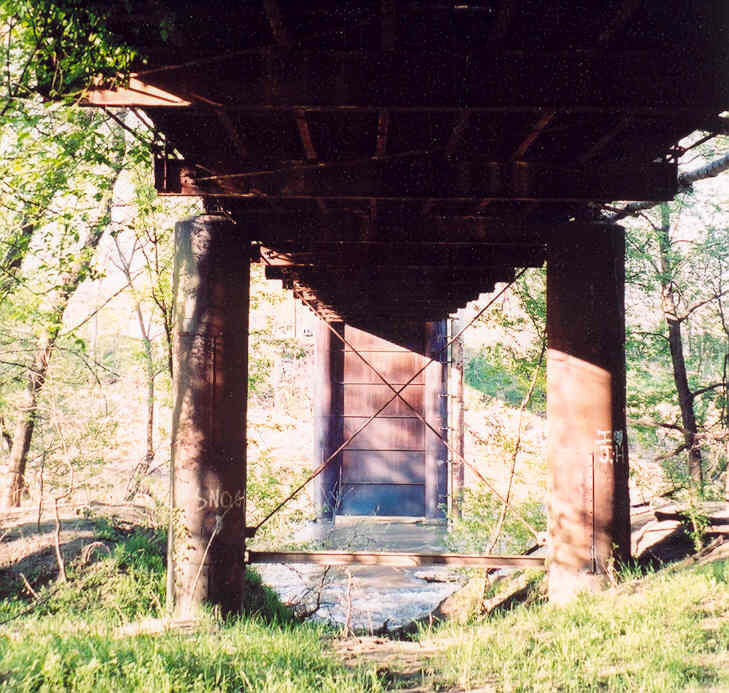 The stream pier features a solid shear wall between the piers, made up of plates and angles, the land pier, which is in the foreground, is braced with a horizontal strut and diagonal tension rods. Below, a deck view of the bridge, looking north. Very minor repairs, such as a new wooden deck would make this bridge a first class structure. If the intentions are to keep the bridge, re-decking and placing some posts at the end to keep vehicles from crossing would be a good idea. This way the horizontal guards could be removed, making pedestrian access much easier. 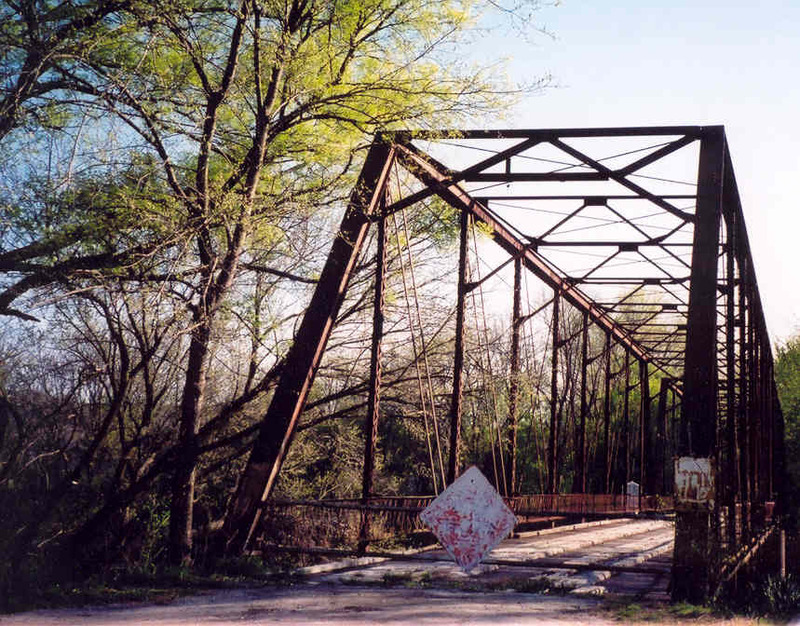 The bridge is sound and an excellent example of an early 20th century steel bridge.